After the release of the Johnnie Walker White Walker limited edition blended whisky, HBO and DIAGEO have teamed up to now release their limited edition collection of classic single malt whiskys with Game of Thrones-inspired dress. These whiskys are now available for pre-order on Amazon in select EU countries (presently that seems to mean the UK, Italy, and Germany) as well as Malts.com. 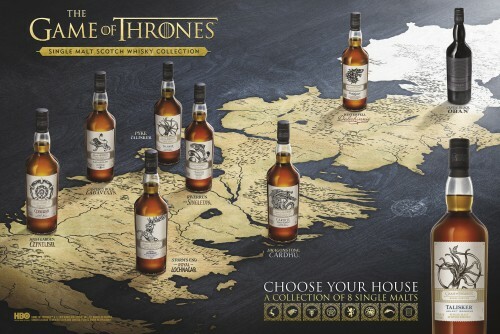 We’re not whisky enthusiasts, but DIAGEO and HBO seem to have put some real thought into this selection, matching up houses (and the Night’s Watch) with whiskys that have some matching quality. For example, the Cardhu Gold Reserve is associated with House Targaryen and Daenerys because of the fact that that distillery was founded by two women, and the Oban was selected to represent the Night’s Watch because the distillery sits beneath a cliff much as Castle Black sits beneath the Wall. Clever.